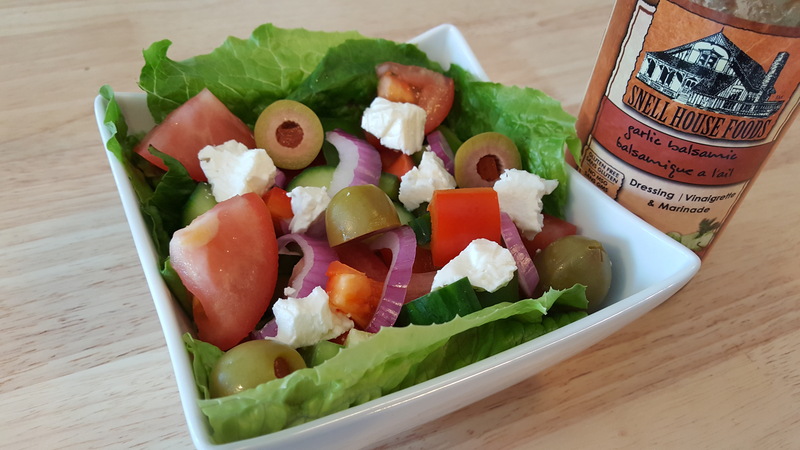 Our Garlic Balsamic Vinaigrette lends itself beautifully as a base for all kinds new creations just by adding an herb or two. In this case two herbs transform it into a typical Greek dressing. Whisk all the dressing ingredients together and set aside for 30 minutes. In a large salad bowl, toss together all the salad ingredients except the cheese and olives. Whisk the dressing again just before adding it to the salad ingredients. Toss well to coat all the vegetables. Serve the salad on individual plates and to everyone gets equal cheese and olives add these items to the salad after plating.